The principal reasons why Brazil can nowadays be considered one of the world´s best investment opportunities include, amongst others, a strong economy, clean energetic matrix and a large domestic market. Brazil has suffered some setbacks due to the political crisis in 2016 and 2017, including corruption scandals and mis-allocation of funds. However, it was equally a testimony of functioning political institutions and a well working juridical system that brought the responsible to justice. Economic core variables like the inflation rate or the PIB have improved considerably, and it is fair to assume that in the near future Brazil will experience an immense take-off in terms of economic performance. Currently, the so-called “country risk” (risco pais) is considered low according to JPMorgans Risk Index. As the world´s sixth largest economy and supposedly soon the fifth largest the country also plays a leading role in Latin American economy and politics, standing out with increased attractiveness in the global scene. While the global average economic growth has remained either negative or close to zero since of the 2008 financial crisis, Brazil´s GDP reached 7.5% in 2010, the highest score since 1986. The subsequent arguments and parameters are corroborated by references from literature that you can find on the “Literature” section of this homepage. Links to current journal and newspaper articles you can find here below. Positively reinforced by the election of the market-friendly president Jair Bolsonaro, bound to assume leadership on the 1st of january 2018, Brazil´s economic future looks brighter than ever. The article highlights several investment-related key-figures and posits Brazil at the pole position on almost all items. 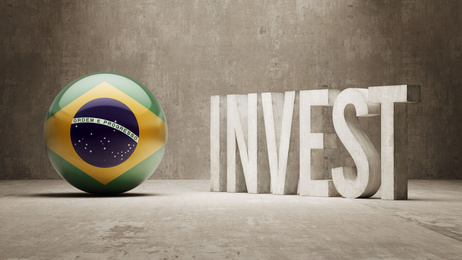 Brazil offers a safe and outstanding investment environment and we consider it our task to introduce international investors to the best available opportunities, based on professonal consultancy and a wide range of services. One of the core areas that we focus in our investment consultancy are investments in Brazilian agriculture. Not only due to its sheer landsize, but also due to its tradition as latin american breadbasket, Brazil has become one of the world´s foremost players in agriculture. Modern, efficient and competitive, the Brazilian agribusiness sector is a prosperous, safe and profitable activity with unsurpassed growth records. The prosperity of Brazilian agribusiness is a result of scientific and technological development in modernizing farming and expanding the industry of agricultural machinery and equipment. The exemplary state of Tocantins (Brazil´s youngest state, founded in 1988) is considered Brazils granary, with almost perfect crop-growing conditions, ranging from fertile argile soils to an average rainfall of 1.700 mm per year. In addition to having a diversified climate, regular rainfall, abundant solar energy and 12 percent of all the available fresh water on the planet, Brazil has plentiful land to plant crops. With 388 million acres of farmable, fertile land, the country has the potential to triple its current production of grains without the need for deforestation. In addition, with the productivity increase in the livestock industry, 30 percent of the 220 million hectares occupied by pasture may be incorporated into agricultural production. According to forecasts of the FAO (Food and Agriculture Organization of the United Nations), and the OECD (Organization for Economic Cooperation and Development), Brazil will be the world’s largest producer of agricultural products by the end of the decade and has already established itself as the third largest exporter of primary products. In recent years, the country has developed and consolidated one of the most efficient cattle-raising systems in the world. This development has been achieved with low level tariff protections and minimal use of government subsidies. Production expansion was primarily due to productivity gains, backed with an efficient agricultural policy supported by extensive research and development. The agribusiness is responsible for approximately 25 percent of GDP and 40 percent of exports. The success of the agricultural sector in Brazil also involves both scientific and technological development in the modernization of rural activity and expansion of agricultural machinery and implements industry. Agricultural research has enabled adapting crops to different types of climate and soil in the main production regions of Brazil. The huge potential of Brazilian agribusiness, tied to quality technical-scientific research, opens up interesting possibilities for private investment in research and development in the country. With a population of more than 190 million, Brazil has one of the largest consumer markets in the world. Today, two-thirds of the food produced in the country is consumed domestically and the rest is exported to more than 200 markets. In recent years, only a few countries have had such significant growth in international trade as Brazilian agribusiness. The ongoing investment in research and development contributes to the success of the country in the production and exportation of various products. It is the first producer and exporter of coffee, sugar and orange juice. In addition, it leads in foreign sales of beef, chicken, soybean oil, grains and bran, and tobacco. That said, the investment opportunities in the agricultural sector are, per se, abundant. Large infrastructure investments by the federal government: the North-South Railway from Itaqui (Maranhão) to Anápolis (Goias) and an extension of this railway leading further to Estrela d´Oeste (São Paulo); the Northern Railway (Ferronorte) in Cuiabá which is a part of the Transnordestin Raily; Part of the Railway FIOL between Varreiras and Ilhéus; expansion/duplication of the Carajás Railway, part of the bridging across the Rio São Francisco; part of the conveying highway Agreste (in Pernambuco, 1.300 km) and the completion of the Pajeú highway, equally in Pernambuco (195 km); completion of the Sertão canal (250 km, Alagoas); completion of the Highway Cuiabá-Santarém (including access to the port of Miritituba); several new highways as well as overhauling of older ones, including privatized ones; 2.000 new agencies of the CEF (Caixa Economica Federal); around 5.000 small and medium-sized investments into health and education (according to PAC 2); around 1,5 million new habitations and residences, almost zeroing the “habitational deficit” of the country; around 400.000 new water and electricity connections (part of the program “Àgua e Luz para Todos” – “Water and Light for Everyone”) – practically zeroing the high anterior deficit. New huge ports and and terminals (TUP), indispensable for the currently overburdened port infrastructure: Large Port in Açu-Rio de Janeiro; another gigantic port in Itaguai-rio de Janeiro; new TEGRAN terminal in Itaguai/Maranhão (capable of storaging almost 10 % of the total corn production in Brazil); new terminal (Coopersucar) in Santos-São Paulo; installation of at least 30 TUP-terminals for private use; construction and handing over of numerous railway stations and highway hubs connecting to the large ports. Hydropower Plants (small and medium-sized) as well as solar plants and wind farms: around 30 new installations as well as renovation/overhauling of older ones; around 20 new windfarms in Ceará, Rio Grande do Norte, Piauí, Bahia, Rio Grande do Sul and Santa Catarina; installation of solar plants in Ceará and São Paulo. If you want to be part of Brazil´s road into the future, consider investing into residential or commercial properties – our team will be happy to support you. long-term, the Brazil Inflation Rate is projected to trend around 3.70 percent in 2020.
increase stability of expectations, also in relation to the real estate market. level towards the near future. recommended to invest at this current point. rate now, and a higher exchange rate in the future. Real Estate Brazil. All rights reserved.